By August 10, 1929, the aerial bridge had been stripped of its gondola and the girders that suspended it from the bridge’s upper truss. Workers then set about the task of preparing the bridge structure for its most dramatic change: extending it 41 feet higher so that, with the roadway span raised, the bridge allowed a clearance of 135 feet for passing vessels. Workers with the KCBC put up “false work,” wooden scaffolding to bolster the bridge during construction, when its span would be separated from the old north and south towers. They also erected another set of taller towers within the framework of the old bridge; the raised span would rest atop the new towers, which would also carry the massive pulleys and counterweights that allowed the bridge’s deck to raise and lower. A crowd estimated at five thousand gathered near the bridge on the morning of Saturday, October 19, to watch as workers armed with acetylene torches cut straps and rivets, freeing the bridge’s entire overhead truss—all 410 tons of it. They then began to slowly raise it into its new position, winching it into place by 10:30 a.m. The crowd was never bored. A seaplane pilot flew his plane under the bridge as the span was being raised, and at least one steel worker mugged it up for the crowd, at one point standing on his head atop the bridge’s tallest point, kicking his feet in the air. Even a film crew was on hand to capture the moment. With the top span in place and the steel work on the new towers complete, the largest unfinished job was the lower span, the roadway that would lift out of the way to allow marine traffic through the canal. Its framework was built in sections between the towers at roughly the height of the old bridge. Workers slung sections of trestle under the overhead truss by cables or cantilevered them from the new towers. By November 7, workers had the first unit in place, reaching toward the middle from the south tower. Work progressed from the north tower a week later. Before the month’s end, workers set the framework’s last piece in place and began permanently fixing it to the new lifting machinery. Not once did construction hamper canal traffic. The construction proceeded slowly. KCBC had promised an operational bridge by the end of 1929, but it wasn’t until January 6, 1930, that the lower span was lowered into place at street level for the first time, ready for its nine-hundred-ton roadway’s installation. The company asked for and received a contract extension, with the bridge’s final touches now due on March 15. Bridge use, however, started at 8 a.m. on January 12, 1930, the first moment cars traveled over the span, which was limited to one lane as workers paved the other. No one recorded who drove the first automobile across the bridge. The first streetcar over the canal began its journey at 5:28 a.m. on March 12. About a week’s worth of minor details still had to be worked through, and the bridge still needed a coat of paint. Otherwise, it was complete. To celebrate the bridge’s opening, the Community Club held a banquet at the Park Point School and a dance at the Park Point Community Clubhouse at Lafayette Square; admission was seventy-five cents for the food and fifty cents to dance. 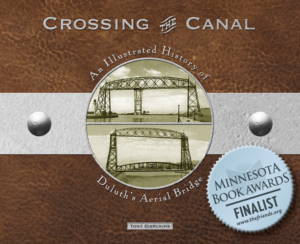 Like its predecessor, the Duluth Aerial Lift Bridge stood as a marvel of engineering, especially considering that the new bridge was built without completely destroying the old. The original bridge’s head span, raised forty-one feet, now provided little more than wind bracing: the new towers carried the moveable road span and massive counterweights. In its new life, the head span was adapted to carry electric conduits and gas and water mains across the ship canal. The power to raise and lower the roadway span came from four electric motors, each of ninety-five horsepower, located in the upper level of the two-story operators house positioned above the road span. Any two of the motors could power a lift. The power came from storage batteries located beneath the South Pier approaches, kept charged by city electricity accessed by both a direct line and by tapping into trolley cables that ran along the top of the lift span (two generators stood by for emergencies). The same room housed a gasoline engine that could move the lift span should electricity completely fail. In the operators house’s lower room, operators controlled the bridge and a host of safety devices positioned at various points on the bridge and its approaches—mechanical and electric interlocks, traffic gates, bells, signal lights, pneumatic horns, and both telephone and radio communication—to ensure safe movement by land and water. With the engines directly above them, lifting and lowering the bridge was loud work for the operators. Numerous inspections and test lifts continued until March 29, 1930, when the Corps of Engineers tug USS Essayons passed outbound to officially test the bridge’s readiness, becoming the first vessel to pass beneath the completed bridge. The first big carrier to pass beneath the bridge, the F. E. Taplin, did so on April 24. Near the end of April, the City Council adopted an extensive set of rules for the bridge’s operation that covered right of way, loitering, warning signals, special consideration for emergency vehicles, how close a car could come to the bridge when it was raised, and others mostly to do with safe operation. Pedestrian rides were strictly forbidden, and violating any of the rules was a misdemeanor punishable by a fine of up to $100 or eighty-five days in jail. A few days later the KCBC notified the City Council that they considered their job complete. A contingency of city officials including the mayor, all five city council commissioners, the city attorney, and the city engineer followed up their biweekly meeting with an inspection of the bridge. 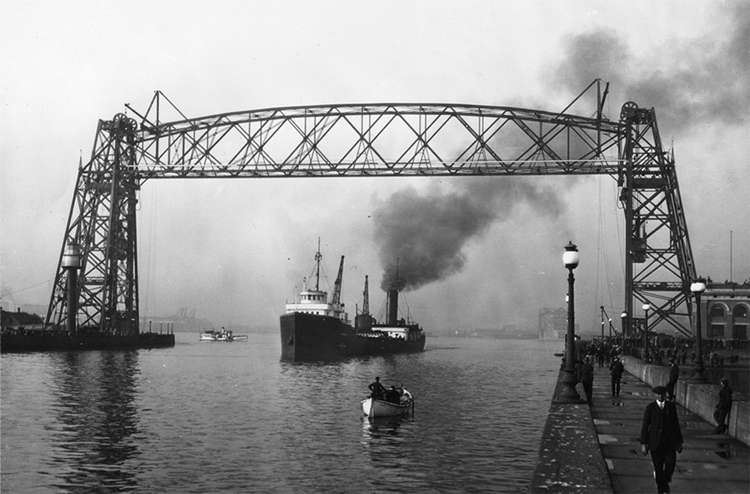 It took nearly a month to work out some minor issues based on requests of the War Department, but on June 5, 1930, Duluth took possession of its aerial lift bridge. Unlike the myriad troubles the aerial transfer bridge experienced its first year, the months after the new bridge began operation seemed relatively problem free. Operators noticed some cable fraying, which they easily corrected. The emergency gasoline engine was used once, but this was traced to an operator’s mistake. But Bridge Superintendant Leonard Green found plenty wrong with the bridge: the back-up engines were too slow for emergencies, four hundred rivets were missing, the shifting gear was impractical and did not allow for quick shifting, the operators house’s windows weren’t weather-tight, the height indicator was falling apart, the main shaft’s coupling was loose, and the oilless bearing sheaves and working cables screamed from a lack of grease, which leaked from the counterweight sheaves. He made his complaints known to the City Council, which decided to withhold $27,500 it still owed KCBC to address these issues and to cover the financial responsibility for changes requested by the War Department that the builders had not completed. Each issue was either addressed or eventually settled. In October W. A. Anderson & Co. put the final touches on the bridge: a fresh deep Essex green paint job over the bridge’s old towers.